Justin Bieber just won "Best Jaw Dropping Moment Award" at the MTV Movie Awards. And the fact that Never Say Never beat out Inception--or anything for that matter—is jaw dropping in itself. 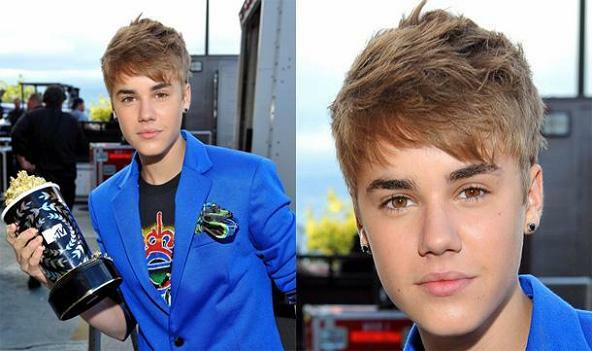 Bieber showed up to the awards show looking just like a chick,he was sporting two earrings and a bright blue blazer. Life partner Girlfriend Selena Gomez mysteriously showed up to the red carpet alone on Sunday night, but she still showed her support for Bieber. "We're hoping that he wins," she said. Bieber was up against Natalie Portman, James Franco and Leonardo DiCaprio. When reporters asked Selena if Justin was there, she said "yes," then quickly corrected herself, saying "oh no, no, he's not here." Bieber was reportedly "thrilled" to accept the award, but I'm not sure what was so "jaw-dropping" about his documentary, except for the fact that so many people wasted two hours of their lives watching it. In all seriousness, though, Justin Bieber is the hottest thing in pop music right now, and a big congratulations to him for sweeping at the MTV Awards shows this season. Twilight ended up taking home the award for Best Kiss, beating out Natalie Portman and Mila Kunis' kiss in Black Swan. The movie was rated R, so I'm sure most of the people who voted weren't old enough to know what that movie is. Jason Sudeikis joked that this was the "Mostly Teen Voters" Awards, but it could also be "Mostly Twihard Voters", because Robert Pattinson and Kristen Stewart are cleaning house. Aside from Best Kiss, Twilight has picked up Best Fight, Best Male Performance, and Best Female Performance. Great work! I wish I could write this well!Very insightful post. I will keep an eye on your blog in the future.